AI90X: 90-Day Artificial Intelligence Accelerator Program | Accelirate Inc. Artificial Intelligence is different than traditional programming. Rather than feeding an input and processing an output, AI requires you to feed data to it and then it will recognize the patterns in that data. This does not happen with some magic. 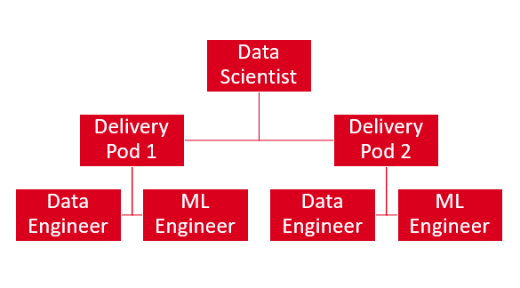 You need Data Engineers to setup the Data Lakes, you need Data Scientists to map different AI models to the Data based on the Prediction Variables, and you need Machine Learning Engineers to consume the programs in your Applications. There are not very many capable Data Scientists out there and the job of mapping AI models to different types of Data is hard, as well as, time consuming. With the evolution of Automated Machine Learning platforms, a lot of this mapping could potentially be automated, but you still need Data Scientists to match and verify the algorithm to the Data. We at Accelirate only focus on Process Automation problems using RPA and we are experts at that because that is the only thing we do. We use Machine Learning to make our Robots smarter and our Data Science teams are dedicated to this mission. 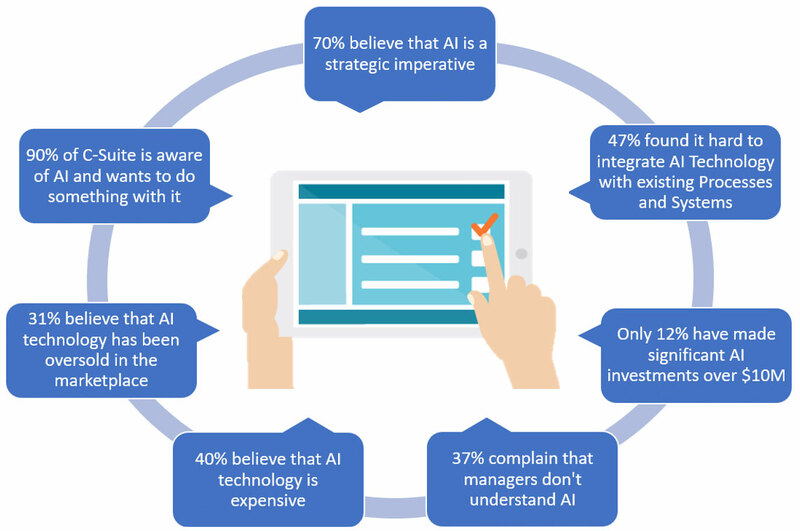 Over the past year or so we have developed a methodology to identify Automation problems which require the use of Machine Learning (the primary technology within the AI umbrella). 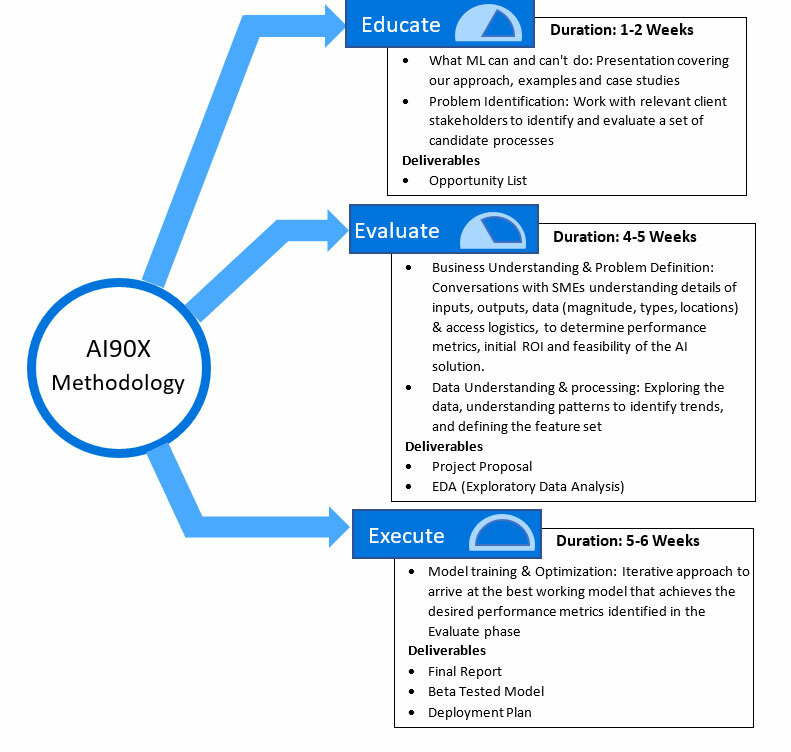 Our AI90X program is designed to help our clients identify such opportunities, identify and consolidate the right data sources, and deliver a working AI model to solve the problem. The table below outlines our AI90X program. Contact us today for more information on Accelirate’s AI90X Offerings.